Australian vocalist/musician Sophia Brous, co-founder and bandleader of the multi-headed musical supergroup EXO-TECH, joins Clocktower in the studio in advance of a hypnotic EXO-TECH show-in-the-round at Pioneer Works, September 4, 2016, featuring an impressive ensemble of musical luminaries from New York and beyond. EXO-TECH explores the intersections between collective improvisation and pop song composition, influenced as much by modern pop and R&B as it is by free jazz, avant garde improvisation, and film music. 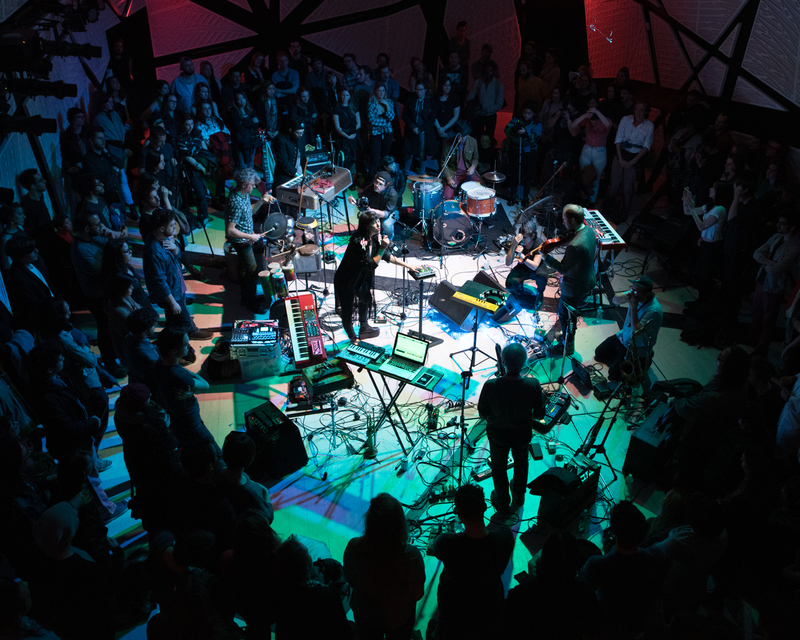 The Pioneer Works ensemble is comprised of Kimbra, Sophia Brous, Yuka Honda (Cibo Matto), Stuart Bogie (Antibalas, Arcade Fire), Mauro Refosco (Atoms for Peace, Red Hot Chili Peppers), Pete Drungle, Danny Meyer (Chairlift, Julia Holter), Miho Hatori (Cibo Matto, New Optimism), Doug Wieselman (Antony & the Johnsons, Laurie Anderson), Jeremy Gustin (Star Rover, Delicate Steve), Spencer Zahn, Benjamin Lazar Davis (Cuddle Magic, Okkervil River), and Cleek Schrey. Special guests include Sean Ono Lennon, Colin Stetson (Bon Iver, Arcade Fire), Caroline Polachek, Jim White (Dirty Three/ Xylouris White), Sarah Neufeld (Arcade Fire), Dave Harrington (Darkside, Dave Harrington Group). Caroline Polachek will be performing a DJ set. Sophia Brous is a vocalist and musician, curator and creative director. Based between New York and Melbourne, she collaborates with a vast number of musicians, companies and festivals internationally, including recent projects with The Barbican, Southbank Centre, Red Bull Studios New York, National Sawdust and MONA, and artists including Julia Holter, Mick Harvey, Kimbra, Kirin J Callinan and the BBC Concert Orchestra. She was resident artist at Robert Wilson's The Watermill Center, and is currently 2016/2017 Resident Artist of Brooklyn's National Sawdust. Brous is also Artistic Associate of the Arts Centre Melbourne where she created Supersense: Festival of the Ecstatic.